We love technology & home automation. One of our favorite products was the nest thermostat. After installing hundreds of thermostats with professional nest installers and working with our technicians in the field we heard something from our clients. The answer at the time was, No. Our customers liked the nest but often times after installing the nest they were let with a couple really tough problems to figure out. They were left with old screw holes in the wall that could be seen after the installation. Our customers would then need to either spend their valuable time painting and patching the wall or install the plastic wall plate that just didn’t have that high end refined look that the nest thermostat has. You just bought a $249 thermostat you want it to work well and also look great, that is one of the biggest draws behind the nest thermostat. Solution from www.NestStuff.com: We created a nest cover plate that had that high end look and matched the nest thermostat with 100% a quality stainless steel matching nest cover plate. Here were a couple situations that our customers ran into and how the nest thermostat cover plates helped them out. We had a client who had installed a high end wall covering where their old thermostat had been located. When they removed the old thermostat they were left with screw holes in the wall. They could either pay thousands to have the wall covering re-done or put up the plastic nest thermostat plate that just did not go with the high end decor of their home. With the round nest thermostat cover plate they were able to save thousands by not needing to redecorate and had a solution that was elegant, refined and matched their high end decor. We had a client that had just moved into their new home that was freshly painted, their nest was installed in their kitchen & living area. Their entire kitchen was decked out with the latest stainless steel appliances, a subzero fridge, a six burner stainless steel range and of course a beautiful granite counter top. The old thermostat was removed and left a 2″ x 2″ hole in the wall. The stock plastic nest cover plate was just not going to match the beautiful kitchen appliances, they ordered a custom nest thermostat square cover plate to give their nest that refined look and cover the 2″ hole in their wall. We had a busy professional client that had just installed a new nest thermostat in their amazing loft. With the loft being in a high rise the thermostat was mounted on a large electrical box and you could see behind the thermostat. Rather that waste time letting people he didn’t know into his luxury loft to patch and paint his walls he ordered a nest thermostat cover plate to allow him to cover up the hole and give his nest that refined look. 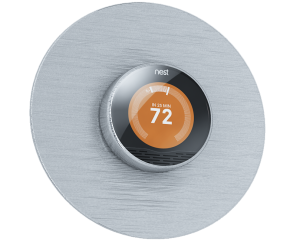 He emailed us a couple weeks later and let us know how thankful he was, he said everyone asked him about the nest and the 100% custom stainless steel nest thermostat cover plate gave it that look that really made it look like a professional installation. Our products are manufactured locally, near our distribution center cutting down on carbon emissions during transport. A nest cover plate eliminates the need to paint or patch the old hole behind your nest thermostat. Installing a nest cover plate saves you money by eliminating the need to paint the location of your old nest thermostat.